Imagine you are running a great business presentation with some prospective clients and suddenly the computer screams - "Stop using Pirated WIndows XP" - You will surely miss some business. This is no wild imagination but a real possibility - Microsoft has big plans to irritate and even embarrass users who have installed pirated Windows XP on their computers. Following download and installation of the "Windows Genuine Advantage Notifications" tool, users of a pirated copy will see alerts at startup, login and during their use of the operating system. The WGA Notifications patch is installed if the user has opted to automatically update Windows via the Windows Update Website or if a XP users manually downloads the latest Windows updates. The frequency of the notification messages is determined at installation time. The notification messages continue to be displayed until the non-genuine copy of Windows has been validated as genuine. The piracy alerts can be suppressed by right-clicking on them when they appear during the running of Windows. It appears that you could be a victim of software piracy. The copy of Windows installed on this computer is not considered to be genuine by Microsoft. The notification will continue to display until your computer is running genuine Microsoft Windows. 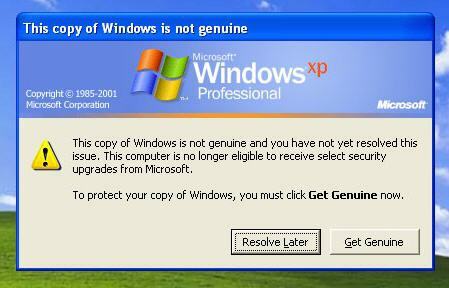 • You can click Resolve now to start the Get genuine Windows process. • You can click Remind me later. If you use this option, an icon will be available in the notification area that you can double-click to start the Get genuine Windows process. 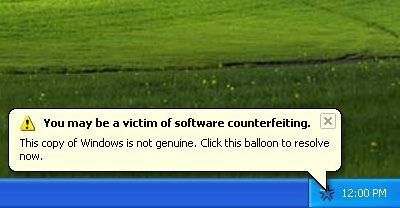 After you log on to a non-genuine copy of Windows XP, you receive a balloon notification message in the notification area that is specific to the validation failure. You can click the balloon notification or the notification area icon to open the Windows Genuine Advantage Validation Failure Web page. This Web page gives you the specifics of the validation failure and the steps that you can take to make the operating system genuine. You might be the victim of software piracy. The copy of Windows installed on this computer is not considered to be genuine by Microsoft. Microsoft isn't pushing Windows Genuine Advantage Notifications out to all Windows users, but to a random subset. But it is only a matter of time before workarounds to byepass the WGA are released as it happened with previous WGA. The patch to remove WGA was released days after Microsoft enabled WGA on Windows Update Website. WGA Notifications patch will be for users in United States, Britain, New Zealand, Australia and Malaysia. How Microsoft Employees Work ? Do Blogs translate into profits ? What is Vista Memory Bandwidth ?